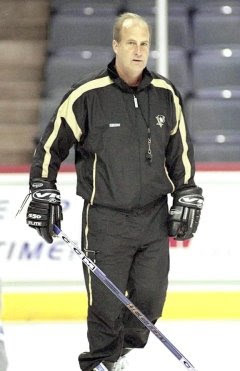 Glenn Patrick was the first ever coach of the Wilkes-Barre/Scranton Penguins. Under his watch the Pens had a 115-152-38-15 record in his four years, including leading the team to the Calder Cup Finals in 2001. Patrick also spent time as a scout for Pittsburgh. Yesterday Patrick agreed to coach for Wyoming Seminary, a prep school in Kingston, Pa. near Wilkes-Barre. Before the Baby Pens came to Wilkes-Barre, this area wasn't much for hockey. Sure people knew who Wayne Gretzky was but they couldn't tell you what teams he played for. Mario Lemieux? The people of NEPA had no clue who he was. They thought he was a character in a Disney movie. So good luck to Coach Patrick. Wyoming Seminary has had some talent come through Kinston. 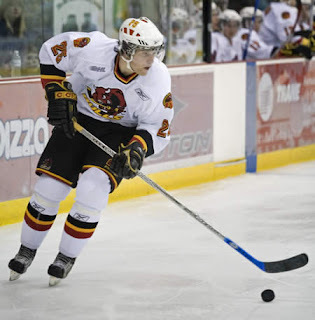 Eric Tangradi, who was acquired in the Kunitz/Whitney trade, is currently in the CHL. Others include Arpad Mihaly who spent some time with the WBS Penguins, Dennis Packard who is with Bridgeport of the AHL, and Ales Parez who is playing in England. Patrick last coached for the Wheeling Nailers from 2005-2008. Now he gets to stay in his adopted hometown to do what he does best, coach. Sure hope Seminary knows what they're getting into. Patrick failed at the Pens, Wheeling and as a scout. Apparently his royal lineage skipped him I'm afraid. He will never equal the success of Chris Button at Sem. Predicyion : Gone before Christmas!! !